Massive spike on the 27th using the EPA data for Carlsbad. Then a death the night of the 27th. UPDATE---5 days after the death, his name was finally released. Any suspected cause of death was not released. I hypothesize that the big snow storm shorted out their electrical primary substation, which stopped the ventilation fans from pulling contaminated air through the HEPA filters, which resulted in a massive release of radiation. The data all fit. Now let some pro-nuker try to disprove my hypothesis. Carlsbad sadnet data shows a large spike on Dec 26 all gamma ranges. 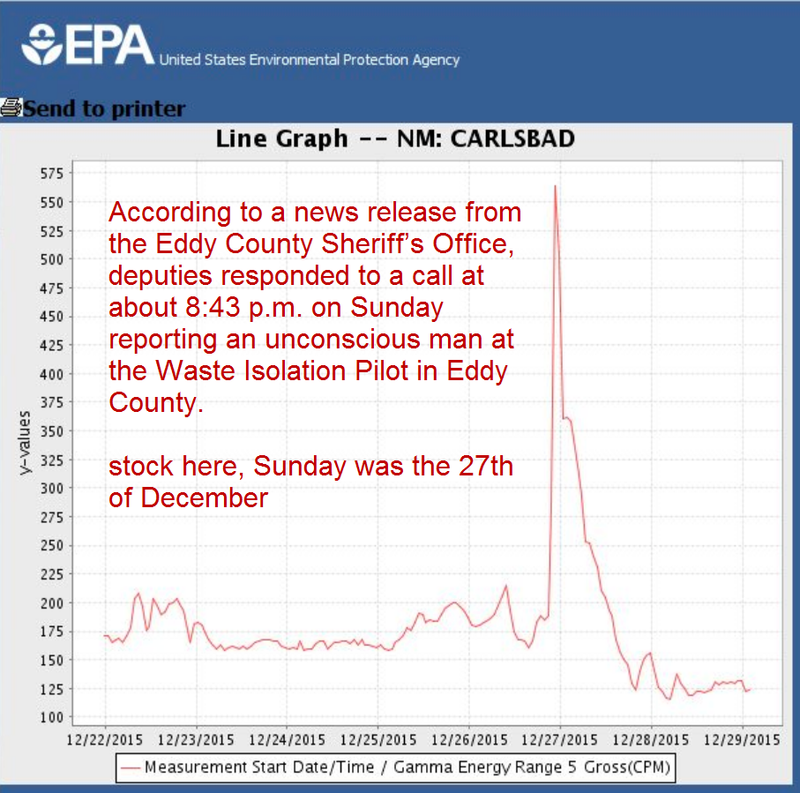 Query Result for monitoring location NM: CARLSBAD. stay over 250 until 1am Dec 27. HoTaters here. Thanks, Stock, for documenting the Gamma spike. If that was there, what else might have been happening? Indeed, what else have we not detected. correlation is not causation. people drop dead sometimes. a release causing rapid death would have to be really massive and one might expect more than one death if a release caused even one. that said, this infernal stuff is so vile that, beyond a few research reactors and a very few power reactors for scientific submarine work, ie a tiny fraction of what man has created, it's simply suicidal stuff - and the making of explosives with this technology is starkly insane. Very few people there, weekend, during holidays, during a freak snow storm. Could be radiation contributed to a pre-existing condition, this was just the last straw. I am not a big believer in coincidences. Nothing at WIPP smells right. Mahalo, and Happy New Year. The Japanese say "Genki Deska?" instead of How Are You. It means, are you healthy. herein coining the new Have a Healthy New Year. The 2nd day after the death, it was announced that he was 62 YO, and confirmed as a plant worker. No I don't think the likely suspects of Pu or Am would kill immediately. I think that after working at WIPP for a number of years, "Murder" is appropriate possibility. But no I don't think he was a victim of a momentum injury. The spike was detected 40 miles away. What was it by the warm ventilation staff that this likely "guard" was perhaps hanging out by, when the fans stopped? Hypothesis. Intuition is more valuable than paid lies. Now we test the hypothesis. Death by electrocution, perhaps? 6mA across the heart can indeed be "immediately harmful". Also note: suicides don't get an autopsy, IIRC. The gamma doesn't seem to fit my slack-jaw armchair guesswork, though it does ring more true to my ears than "people drop dead sometimes". My memory fails as to how filtration or bypass is engaged, including during a station-out. One thing seems certain though, and that is that there is probably at least one more family that totally hates WIPP, and for good reason - their loved one is dead. That "organization" seems a genuine "FAIL army", neh? Ya eh, but the coincidences, are very coincidental. The gamma was detected 30 miles away, what happened on site? Why no cause of death release?